A wide array of Ring-O-Matic options makes it possible to custom-order the 1300 VXT to match any operation's requirements. 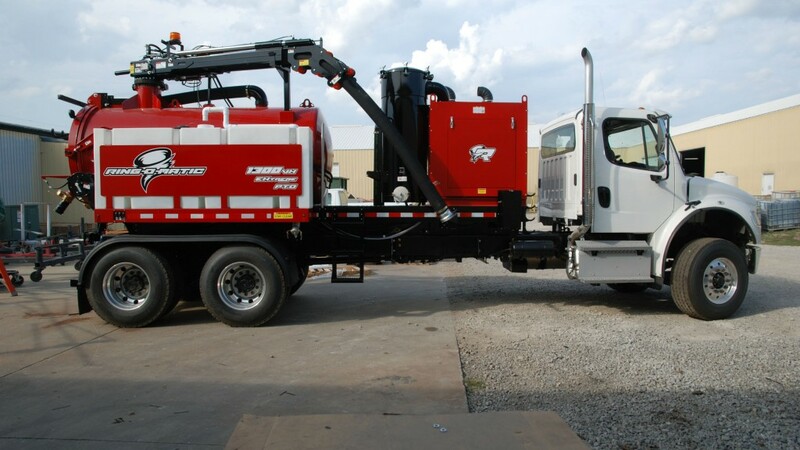 The standard unit comes mounted on a double-axle, 60,000-pound Freightliner carrier featuring a 1700 cfm blower and a 6-inch, fully hydraulic boom. Ring-O-Matic also displayed its 350 VXT HiCFM Air-Equipped and compact FT150 vac-ex units, designed for carriers in the 26,000 pound GVW class or smaller, the 350 VXT is based on the traditional dedicated-engine design suited to most operations. With its 150-gallon spoils tank, the FT150 gives rental agencies and startup contractors an economical, versatile hydro-excavator to use on jobsites too small for typical vac-ex rigs such as the tight confines of many urban residential properties. The FT150 mounts easily in the bed of a pickup or on a trailer. It can also be mounted to a skid-steer via an attachment plate. All three configurations were on display during ICUEE.